December 3 is a holiday for all the coffeeholics out there because the National Peppermint Latte Day is observed on this date. Celebrate this food-related holiday by treating yourself to a cup of peppermint-flavored caffellatte. Latte is a coffee drink made with espresso and steamed milk. It became widely spread in the United States in the early 1990s. This coffee beverage is usually prepared in an 8 oz cup or glass with one single or double shot of espresso (30 ml or 60 ml) and filled with steamed milk. It is also topped with approximately 1/2 inch thick layer of foamed milk. Latte can be flavored with different syrups. A peppermint latte or a peppermint mocha is a seasonal Christmas drink in many coffee shops. That is why there's no wonder the National Peppermint Latter Day is celebrated during the holiday season. 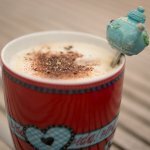 You can easily make peppermint mocha latte at home. Make a shot of espresso or brew 1/2 cup strong coffee and pour it into a mug. Combine 1/2 cup milk, 1/4 cup chopped chocolate chips and some mint syrup in a saucepan. Stir and cook in microwave until all the chocolate is melted. Whisk until foamy and pour over the coffee. If you don't feel like making coffee, you can go to a local Starbucks to celebrate.